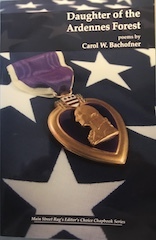 This book was written as an homage to my father who served in the WWII Battle of the Bulge. He was a POW for 8 months and suffered terrible PTSD (called shell shock back then). He was wounded and received a Purple Heart. He became ill during his imprisonment. Our whole family ended up with the fallout of his experience. I decided to write these poems to get him some closure. Sadly, he died before I wrote the book and never got to read it. in men’s uniforms waged war. army men; this was the real McCoy. when our fathers marched off to war. time to pay up, or to collect the prize. For some, the usurer knocks at the door.